Yesterday, March 23, 2015, Akira Kurosawa would've turned105. 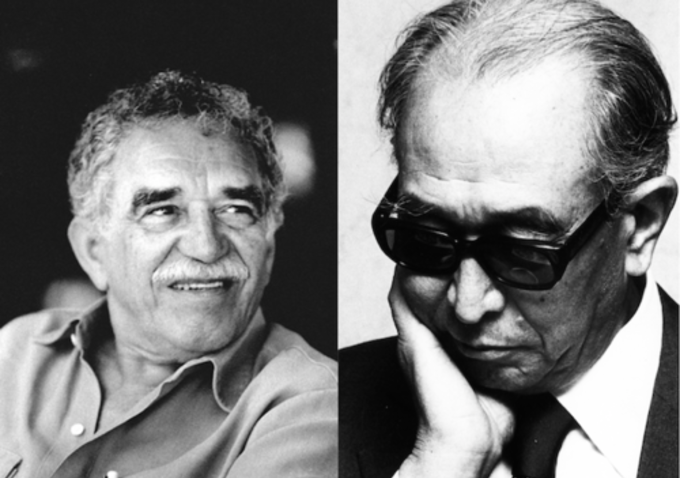 Since it's never too late to learn from a master, here is famed novelist Gabriel Garcia Marquez interviewing Akira Kurosawa about the art and craft of cinema, filmmaking and screenwriting and most importantly, humanity. On June 23, 1991, author Gabriel Garcia Marquez spoke with 81-year-old Japanese director Akira Kurosawa in Tokyo last October when the film maker was shooting his latest movie, "Rhapsody in August." The film, which is scheduled for release in this country in December, was recently shown at the Cannes Film Festival where, Marquez reports, it received public and critical acclaim but annoyed some U.S. journalists "who considered it hostile to their country." Marquez, a former film critic in Bogata, Colombia as well as the author of "A Hundred Years of Solitude," spoke with Kurosawa on a diverse range of topics for more than six hours. Gabriel García Márquez: I don’t want this conversation between friends to seem like a press interview, but I just have this great curiosity to know a great many other things about you and your work. To begin with, I am interested to know how you write your scripts. First, because I am myself a scriptwriter. And second, because you have made stupendous adaptations of great literary works, and I have many doubts about the adaptations that have been made or could be made of mine. Akira Kurosawa: When I conceive an original idea that I wish to turn into a script, I lock myself up in a hotel with paper and pencil. At that point I have a general idea of the plot, and I know more or less how it is going to end. If I don’t know what scene to begin with, I follow the stream of the ideas that spring up naturally. Marquez: Is the first thing that comes to your mind an idea or an image? Kurosawa: I can't explain it very well, but I think it all begins with several scattered images. By contrast, I know that scriptwriters here in Japan first create an overall view of the script, organizing it by scenes, and after systematizing the plot they begin to write. But I don't think that is the right way to do it, since we are not God. Marquez: Has your method also been that intuitive when you have adapted Shakespeare or Gorky or Dostoevsky? Kurosawa: Directors who make films halfway may not realize that it is very difficult to convey literary images to the audience through cinematic images. For instance, in adapting a detective novel in which a body was found next to the railroad tracks, a young director insisted that a certain spot corresponded perfectly with the one in the book. "You are wrong," I said. "The problem is that you have already read the novel and you know that a body was found next to the tracks. But for the people who have not read it there is nothing special about the place." That young director was captivated by the magical power of literature without realizing that cinematic images must be expressed in a different way. Marquez: Can you remember any image from real life that you consider impossible to express on film? Kurosawa: Yes. That of a mining town named Ilidachi, where I worked as an assistant director when I was very young. The director had declared at first glance that the atmosphere was magnificent and strange, and that's the reason we filmed it. But the images showed only a run-of-the-mill town, for they were missing something that was known to us: that the working conditions in (the town) are very dangerous, and that the women and children of the miners live in eternal fear for their safety. When one looks at the village one confuses the landscape with that feeling, and one perceives it as stranger than it actually is. But the camera does not see it with the same eyes. Marquez: The truth is that I know very few novelists who have been satisfied with the adaptation of their books for the screen. What experience have you had with your adaptations? Kurosawa: Allow me, first, a question: Did you see my film "Red Beard?" Marquez: I have seen it six times in 20 years and I talked about it to my children almost every day until they were able to see it. So not only is it the one among your films best liked by my family and me, but also one of my favorites in the whole history of cinema. Kurosawa: "Red Beard" constitutes a point of reference in my evolution. All of my films which precede it are different from the succeeding ones. It was the end of one stage and the beginning of another. Marquez: That is obvious. Furthermore, within the same film there are two scenes that are extreme in relation to the totality of your work, and they are both unforgettable; one is the praying mantis episode, and the other is the karate fight in the hospital courtyard. Kurosawa: Yes, but what I wanted to tell you is that the author of the book, Shuguro Yamamoto, had always opposed having his novels made into films. He made an exception with "Red Beard" because I persisted with merciless obstinacy until I succeeded. Yet, when he had finished viewing the film he turned to look at me and said: "Well it's more interesting than my novel." Marquez: Why did he like it so much, I wonder? Kurosawa: Because he had a clear awareness of the inherent characteristics of cinema. The only thing he requested of me was that I be very careful with the protagonist, a complete failure of a woman, as he saw her. But the curious thing is that the idea of a failed woman was not explicit in his novel. Marquez: Perhaps he thought it was. It is something that often happens to us novelists. Kurosawa: So it is. In fact, upon seeing the films based on their books, some writers say: "That part of my novel is well portrayed." But they are actually referring to something that was added by the director. I understand what they are saying, because they may see clearly expressed on the screen, by sheer intuition on the part of the director, something they had meant to write but had not been able to. Marquez: It is a known fact: "Poets are mixers of poisons." But, to come back to your current film, will the typhoon be the most difficult thing to film? Kurosawa: No. The most difficult thing was to work with the animals. Water serpents, rose-eating ants. Domesticated snakes are too accustomed to people, they don't flee instinctively, and they behave like eels. The solution was to capture a huge wild snake, which kept trying with all its might to escape and was truly frightening. So it played its role very well. As for the ants, it was a question of getting them to climb up a rosebush in single file until they reached a rose. They were reluctant for a long time, until we made a trail of honey on the stem, and the ants climbed up. Actually, we had many difficulties, but it was worth it, because I learned a great deal about them. Marquez: Yes, so I've noticed. But what kind of film is this that is as likely to have problems with ants as with typhoons? What is the plot? Kurosawa: It is very difficult to summarize in a few words. Marquez: Does somebody kill somebody? Kurosawa: No. It's simply about an old woman from Nagasaki who survived the atomic bomb and whose grandchildren went to visit her last summer. I have not filmed shockingly realistic scenes which would prove to be unbearable and yet would not explain in and of themselves the horror of the drama. What I would like to convey is the type of wounds the atomic bomb left in the heart of our people, and how they gradually began to heal. I remember the day of the bombing clearly, and even now I still can't believe that it could have happened in the real world. But the worst part is that the Japanese have already cast it into oblivion. Marquez: Thank you very much. All things considered, I think that if I were Japanese I would be a sun yielding as you on this subject. And at any rate I understand you. No war is good for anybody.